Some of my favorite birds are the thrushes, which include the robins and the bluebirds. 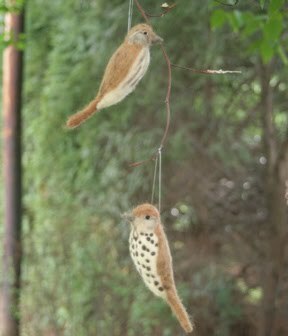 At my last market in Norfolk, a customer asked me to make a wood thrush and a hermit thrush for her. I told her that they were very similar - was she sure she wanted me to do both? She said her husband loves both, and to go ahead and make both of them. Well, it was a bit of a challenge to make them so they looked different enough! Actually, the challenge was in seeing the differences; once I did that, making them was not hard. 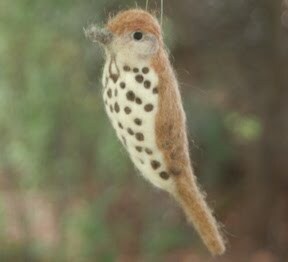 Here's the wood thrush. He's got a redder head, and the spots on the breast. 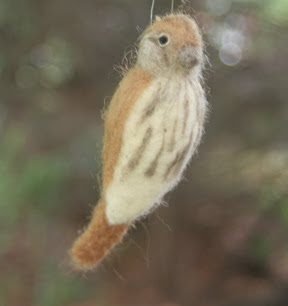 They say in descriptions that this is a bird of the deep woods, but I hear them in the not so deep woods near my house and definitely in the park. I think I saw a young one flitting among the trees in the park recently. Here's the hermit thrush. He has a redder tail, and his markings are more streaky than dotty. That's the link for his song. 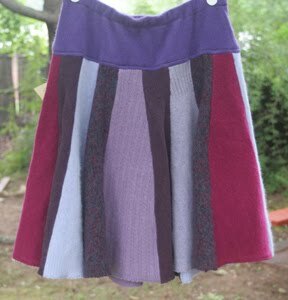 I had a bunch of purple sweaters, and just had to make an all-purple skirt. Here it is. Hopefully it will make a woman with a passion for purple happy!